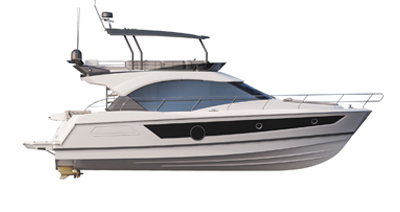 The smallest of the Express cruiser range, the Gran Turismo 34 has lots of appeal. Volvo 2x300 HP Diesel or MerCruiser 2x300 HP petrol engine. The accent is placed on style and reception space on board. The Gran Turismo 34 has elegant lines and a resolutely sporty look. Designed to enjoy living at sea to the full in all weather, her hardtop provides excellent protection. Wherever you are on board, you can see the sea. The GT 34 comes in a limited “special” edition that has three different hull colours. There is a surprising amount of space inside. She has two separate berth spaces, as well as all the equipment you need for cruising with family or friends. Walnut woodwork and cosy grey taupe upholstery create a warm contemporary atmosphere on board. There are several ways to personalise the boat, available on option. at anchor to the full. Quicker acceleration, higher maximum speed and lower fuel consumption. With excellent sea-keeping, she makes easy passage through the waves and her response to curves is optimized. “Air cushion” effect to the rear of the hull, linear acceleration, curves easily handled. Beneteau Air Step® patent - Designers: Maud Tronquez, Patrick Tableau, Remi Laval-Jeantet. The Gran Tursimo 34 cockpit has a large U-shaped saloon seating six people – converting into a large sun lounger – and protected by a hardtop with sliding roof. An extension of the swim platform to 1.3 m is available on option to fully enjoy swimming. This is an exclusive feature on a 34-foot boat. The separate aft cabin has a large window over the sea thanks to a panoramic porthole. This cabin is surprisingly generous in volume, thanks to its headroom (1.94 m maximum). To the bow, the traditional U-shaped saloon turns into a double berth and offers extra overnight space. CE Certification B8 - C10. Large forward sun-lounger, lifting backrest. Stern Drive propulsion and joystick steering(en option). Swim platform extension total length 1.26 m.
Cockpit saloon converts into a large sun-lounger. Spacious aft cabin with good headroom and a gigantic porthole. Saloon converts into a double berth. Galley with gas rings, sink, worktop and lots of storage. Bright comfortable saloon with sea view on either side, convert into berths. Air-conditioning or heating on option.